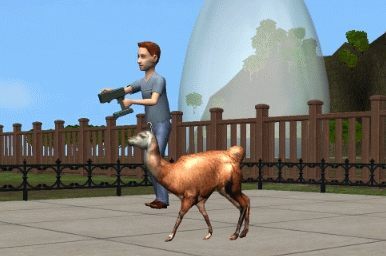 Llamas are very docile and obedient animals... But would have you guessed that they were *that* obedient? Even a child, using the special included controller, can run the Llamaborghini all over the room. The Llamaborghini works with any game! The rar contains two files: both of them must be copied into the Downloads folder, in order for the Llamborghini to work. Like all the Dynamic Duo's creations, you can freely recolour this object, and post your recolour anywhere, as long as you give credit to the Dynamic Duo and provide a link to the mesh (i.e. this very thread). DO NO include the mesh in your recolours. You CAN NOT CLONE nor repost this object on any site, especially the Exchange. You CAN NOT INCLUDE this object in your uploaded lots (you can show it in the screenshots, but please remove it from the lot before uploading). NewAgeMobile.co.uk for the Impreza RCCar (from which the Llamaborghini was cloned, as per permission in the original thread). Biggest thanks to Lethe_s for having helped with the llama mesh. 556 people have said thanks to Dynamic Duo for this download. The Llamaputer - *Working* English-Llamish translator *with custom sounds*!